Leaving Skofja Loka on the 28th of May we planned to stop off at the famous ‘Caves of Postojna’, which were on our way to the coast, and then visit the Moto Parilla factory in Milan to collect some more spare parts, before moving on to Albi via Nice and Toulouse. The caves were truly spectacular and well worth the 3 hours or so we spent there. A visit, which I have now done on two occasions is in my opinion, a must for anyone visiting Slovenia and/or Croatia. We managed to collect the spare parts we required from Moto Parilla even though the factory was shut down at the time of our visit. This, we were informed, was because Moto Parilla were over stocked with new bikes and were waiting to ship out some large export orders before planning to start up assembly again. The signs were becoming more ominous! 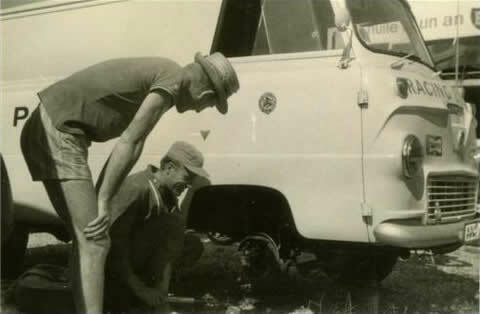 Once out of the Milan traffic, which even in 1964 could take anything from between 3 to 4 hours to escape, the rest of our journey was uneventful, but rather slow, along the winding and congested coast road. We did not get to Nice until late in the evening of the 30th of May, arriving too late to start looking for a camp site or other convenient stopping point. The weather was so warm, we just parked the Thames on the ‘Promenade des Anglais’ unpacked our sleeping bags and slept all night on the beach, without interruption. Try this today and you would, I think, be either mugged or arrested as an illegal immigrant! 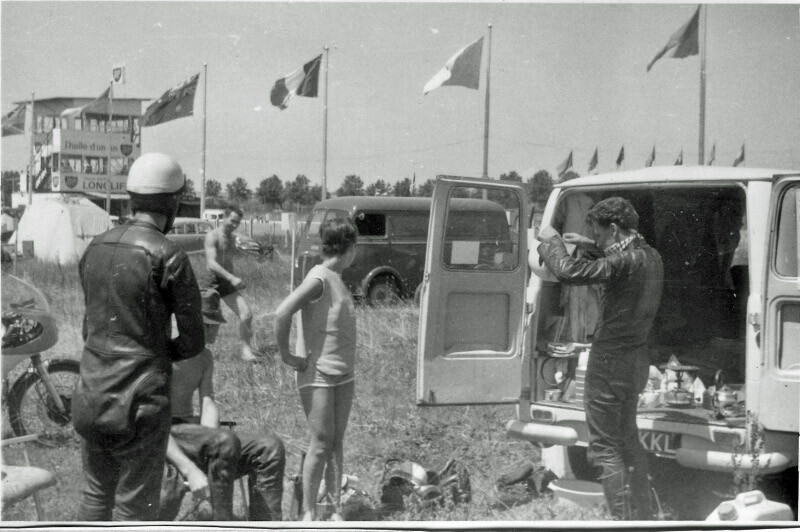 Arriving at Albi on the 3rd of June, we discovered that the regular British contingent including Peter Gibson and Norma, Jim Vincent, John Summers, Vernon and Margaret Cottle, together with Ginger and Claire Molloy had already arrived and set up camp in the middle of the circuit race paddock, as far as it was possible, to get away from the public address speakers! It’s bad enough at some English circuits when race commentators are shouting all day, but when in a foreign language, it’s just too much and could drive anyone mad! The Albi race circuit based on a private Flying Club airfield some 4 miles outside of the old City, approximately 2 miles in length, had one long and two short straights, two rather tight right hand bends, one S bend and one further somewhat faster right hand bend at the end of the short start and finishing straight. The surface was good and I expected the Moto Parilla’s to go well, it also appeared that no known ‘Raiders’ had entered this race meeting. Any hope for another possible podium finish were soon somewhat dashed however when I heard it rumoured the Bultaco Works riders Ramon Torras and Ginger Molloy would both, be riding 125 and 250cc Bultacos with the latest more powerful, and reputedly reliable engines and Jean-Pierre Beltoise (French motorcycle & future F1 Champion) had entered in the 250cc race on a very quick Morini. Vic, hair by Norma Albi, June ’64 Note broken Moto Parillas! Vernon & Margaret Cottle clearing up with Peter Gibson cleaning his Ducati, RM’s Moto Parillas (38) & (95) in the background. 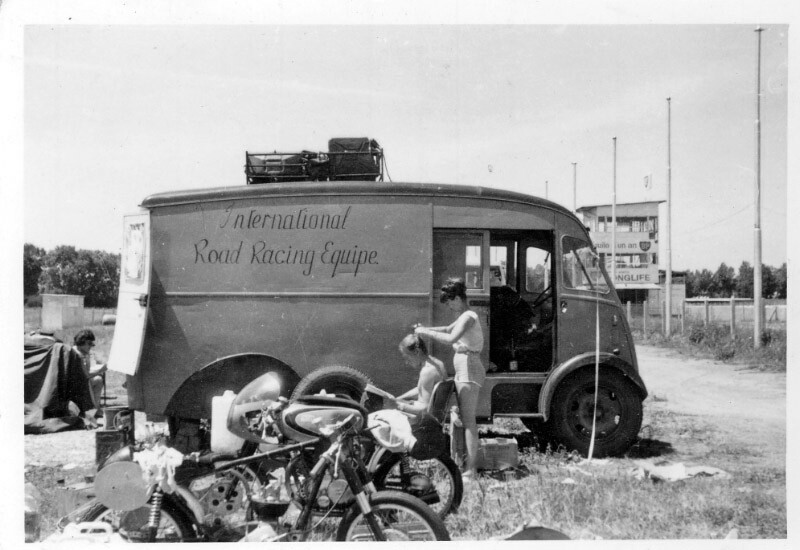 Albi paddock June 1964. Practice went quite well and as I had expected Torras, Ginger and Jean Pierre (J.P) were well clear of the rest of us in both timed sessions. Getting a very good start from the 2nd row in the 125 race I was ahead of the pack coming out of the first right hander onto the long straight but this did not last long when first Torras and J.P closely followed by Ginger went screaming past, they were going so fast in fact that I had very little time to get my customary tow and both were out of sight by the start of the 3rd lap! 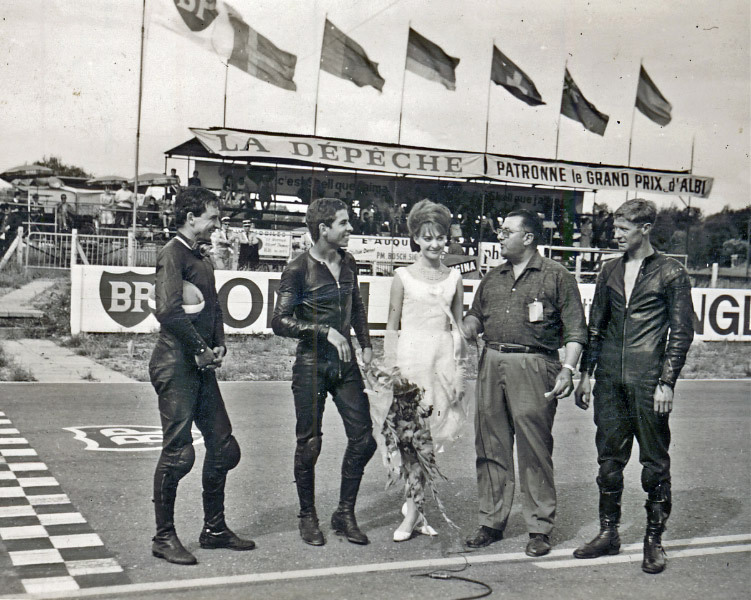 The race was won Ulf Svensson (Honda) followed by Jean Pierre (Bultaco) and Jess Thomas also on a Bultaco. I was reasonably happy with my own 11th place finish having been mixed up with a hoard of Bultacos and Ducatis from almost the start to finish. This time from the 1st row of the grid, I again had another very good start and lead the 250cc race to almost half way down the long straight when once again Torras, J.P and then Ginger came past but not as quickly as in the 125cc race and I was able to stay in Ginger’s slipstream for 3 or 4 laps whilst he held position very close behind J.P.B. To keep with them and maintain my tow I had to be very close to the rider in front of me coming out of the tighter bends onto the straights as they both clearly had better acceleration and top speed than I when in clear air. On the 4th or 5th lap I pushed my luck, or to be more precise my brakes, too far and overshot the bend at the end of the long straight and almost left the circuit! By the time I had recovered the leading riders were long gone and I had no hope of any further assistance from slipstreaming! Dropping my revs back from around 8,500 to 8,000 RPM and hoping that I would now at least be able to hold on to my current position I continued for another 12 or so laps without any pressure from following riders when I spotted Ginger coasting at the side of the track and then, shortly after, noticed that J.P was riding alone and slowing down as I was now closing on him very quickly! On inspection back in the paddock, it turned out that the high camshaft chain drive sprocket and gear rivets had sheared. We had not been aware of this weakness and I was not amused when later a Design Engineer from Moto Parilla informed me that the factory had made a modification to overcome the known problem some 18 months earlier when introducing a new X2 cam profile for the Moto Parilla Wildcat scrambler! After the race, J. P came to see why I had retired. He told me that he was also having trouble with his engine overheating when Ginger’s engine seized and that he had been coaxing his bike to the finish whilst at the same time trying to stay ahead of me when to his relief I also dropped out. Later in the day, J.P. won the 500cc race on his G50 Matchless followed home by Ginger Malloy also on a G50 Matchless and Robin Fitton (Norton). The final results show that I finished in 9th place riding my 256 Moto Parilla but I now have no recollection of the start or my progress in this race !! That evening at the prize giving reception J.P. introduced me to a French race organiser who was planning an International meeting at Luneville on, I think, the 28th June at which J. P had already entered. Following his invitation I also agreed to enter the meeting on my 125, 250 and 256cc (to be ridden in the 350cc class race). This meeting had not been planned in my original race program for the year but as the time and place were convenient I was very pleased to accept the offer & grateful to J. P for the introduction. Little did J. P or I realize at the time that in less than 5 years we would both be working for Colin Chapman at Lotus, but that’s another story for another day! On to the next chapter, Schleiz……..